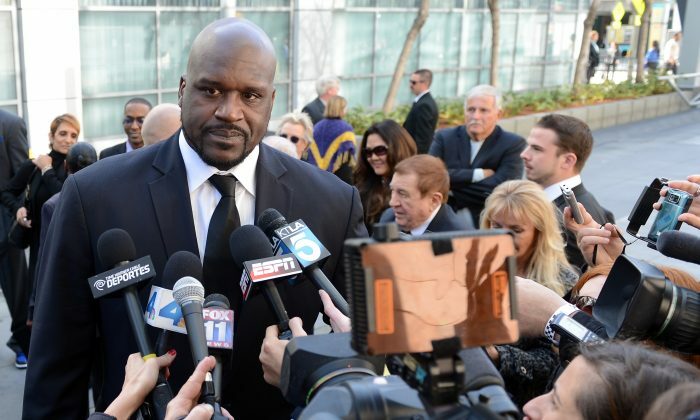 Basketball Hall of Fame center Shaquille O’Neal weighed in on the debate about how to curb school shootings, after the recent Parkland, Florida school shooting took place not far from his Fort Lauderdale home. Shaq explained how police presence curbed school violence during his own upbringing, via a radio appearance on WABC. O’Neal has long shown interest in law enforcement. He has an honorary officer or reserve officer status in law enforcement agencies across the country. He has unofficially gone through the police academy. He also announced plans to run for Sheriff in Georgia in 2020, ESPN reported. He explained why banning guns won’t end gun violence, via WABC. “I hear a lot of people talking about getting these guns off the streets. The only problem with that is that there’s 15 million of them out there already on the streets. And then another problem is that if you ban them you’re going to create an underground market, and the gun collector is going to become more valuable. Shaq was on WABC’s Curtis and Cosby show primarily to discuss winning the prestigious Jefferson Award for his service to the public and his work with youth. He talked about his upbringing under a strong military stepfather and how that led to his philanthropic work and general outlook towards life. “It’s something that I’ve been doing all my life, something I was not expecting an award for. Some people call it ‘giving back.’ This is what I was taught ever since being a youngster,” Shaq said about winning the award, via WABC. Shaq also shared how his parents gave him the tools that he uses to help youth and people less fortunate.